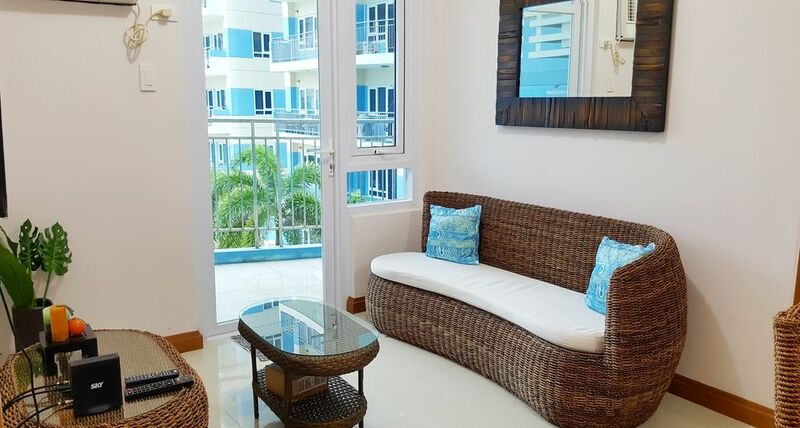 This 2-bedroom apartment has a great pool and sea view perfect for everyone from business travelers to vacationers foreigners and locals alike, who want to have a home away from the hustle and bustle of the city and where they can relax and enjoy the feel of nature. The unit is spacious enough to sleep up to 4 guests. This cozy apartment comes with free WiFi, cable TV, air conditioning, hot &amp; cold shower and laundry machine. You can enjoy the conveniences of home with a full kitchen complete with cooking and dining utensils to help you prepare your own meals. The property boasts of lush eco-friendly landscapes and a lot of recreational activities. Each unit comes with a balcony to ensure that you will have your own private space where you can relax while enjoying the sweetness of the fresh air and scenic views of the ocean and its adjacent island, Olango, which supports the largest concentration of migratory birds found in the country. The island also boasts its abundant marine life which makes it a great diving spot and an island hopping destination. The property is located on the 3rd floor of Tower A in Amisa Private Residences in Barangay Punta Engano, in the island of Mactan in Cebu City, Philippines. Amisa is a leisure residential community amidst the stunning seascape of Mactan that provides a holiday ambiance and a vacation lifestyle. A lot of world-class hotels and resorts are within the area. It is also close to white sand beaches and diving spots. Shopping malls like Gaisano Grand Mall, the Mactan Marina Mall and Island Fiesta Mall and the Mactan Cebu International Airport are 30-minutes away from the property. The beach is temporarily non-operational due to an on-going hotel construction.